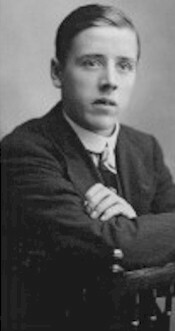 Samuel Burdett was born on the 20th January 1896, the son of Samuel (b. 1864, Beeston) and Emma Burdett (b. 1864, Lincolnshire, née Scott). In 1901, the family was living at 9 Broughton Street, Beeston with Samuel senior working as a bricklayer - a trade that had been followed by several generations of his family in Beeston. An elder brother, John William, aged 16, was working as a bricklayer's labourer and, as well as the 5 year-old Samuel, his sister Annie, age 11, and his younger brother Frank, age 3, were at home.2 A further brother, Fred, was born early in 1904, within about six months of his father's death. He took part in most of the activities offered there and excelled at gymnastics, although his photograph does not appear in any of the football teams. After school he was employed in the Raleigh Cycle Works where he remained until he enlisted in the army. Samuel was yet another of the Old Boys to March as a party to Nottingham where he enlisted with the others in the Sherwood Foresters Regiment. As shown in the photograph, he joined "B Company" of the 3rd Battalion, which at the time were stationed at Plymouth. Samuel is standing third from the left. Private Burdett was later posted to the 11th Battalion, another one of "Kitchener's" new Service battalions and known as "The Men from Greenwood". 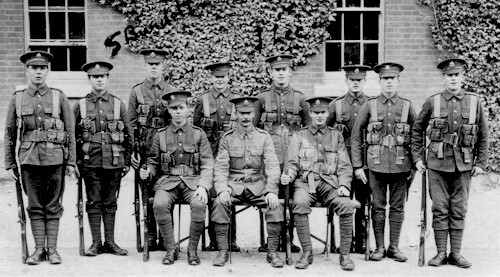 The 11th Battalion Sherwood Foresters was formed at Derby on 17th September 1914; the men who enlisted were largely miners from Derbyshire and Nottinghamshire. It became part of 70th Brigade 23rd Division, and after training it landed in France on the 27th August 1915. 1st Day of the Somme; the attack on Leipzag Salient - The 11th Sherwoods moved from Bouzincourt on the 30th June 1916 and up to the assembly trenches named as such; "Glasgow Road", "Lower Howich Street", "Quarry Post" and "Bamberbridge Street", prior to their attack on 1st July. The battalion along with the 9th Yorks & Lancs, were in support of the attacking battalions, the 8th Yorks & Lancs and the 8th Kings Own Yorkshire Light Infantry. In the assembly in Authuile Wood which formed part of "Blighty Valley", they came under heavy German bombardment and began to suffer their first of the many casualties. The time arrived for the 11th Battalion "Notts & Derbys" to go over the top and, as soon as the attacking first wave left the trenches, it was caught in a tremendous withering fire from the enemy machine guns. It was during part of this day that Sam Burdett lost his life. 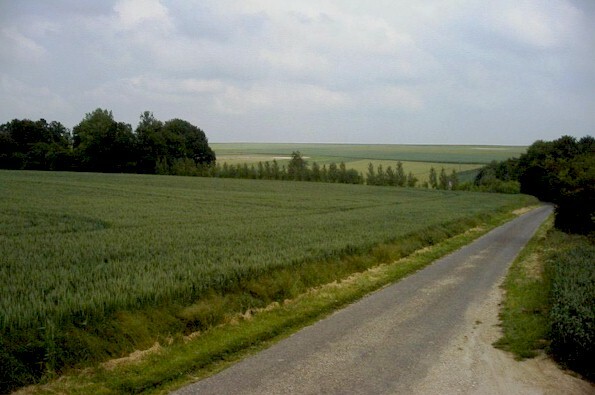 The photograph on the left shows the view from the north east corner of Authuille Wood just in front of the British front line, looking forward to the German front line on the ridge opposite, as seen today. The lifelong friendship of three Boys Brigade pals finally came to an end when news was received in Beeston that Private Samuel Burdett had been killed in action on the first day of the "Battle of Somme", 1st July 1916. He was in the first line of Sherwood Foresters who went over the top at 7.30am on that fateful morning. His Beeston Old Boy’s chum Cyril Turton had been the first of the pals to be killed during the "Battle of Neuve Chapelle" in March 1915, while later, in October 1915, another pal from the Old Boy's, George Brackner had died of Pyrexia while serving in Gallipoli. Sam and George were, at one time, neighbours on Broughton Street, Beeston5. All three were part of the contingent who enlisted together in late August 1914. 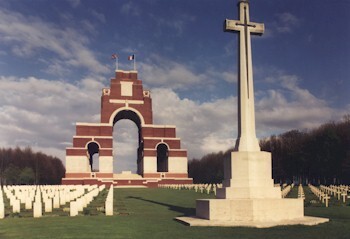 Private Burdett’s body was never found and he is commemorated among the 73,000 who have no known grave, on the Thiepval Memorial. 4His father had died in 1903, aged 39. His mother died in 1914, aged 50. At the time of his death, the Beeston Gazette and Echo listed his brother, who lived on Broughton Street as his next-of-kin and W (presumably, John William) Burdett of 4 Broughton Street, Beeston is shown as his brother on the CWCG site. 5Samuel Burdett and George Brackner were, in fact, cousins. George's mother, Sarah Ann, and Samuel's father, Samuel, were brother and sister.